Boo. I asked a question some months back which you mentioned, but did not answer. Perhaps I can ask again? 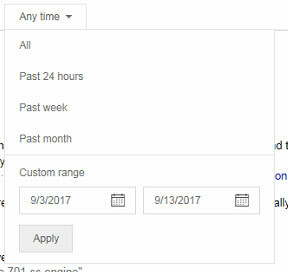 I need to limit my search results by date. For example, I want to search for mythtv. 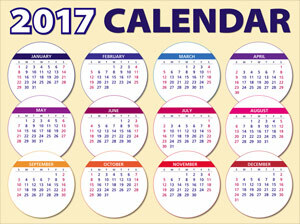 This is sort of useless and I find many old out of date results. Some info is outdated, some is flat wrong, some companies or web sites have closed down. I waste lots of time checking the results. Is there a way to search for mythtv, but use a date limiter of ONLY the last 3 years and not all the old useless junk? I mostly use the search engine duckduckgo but sometimes use Bing, Google, or Yahoo. I am on your mail list and have enjoyed your weekly mail for the past 2 years. Thanks. I don’t know how Mike’s question slipped through the cracks but I told him we would get it answered, so here it is. Sounds like interesting software. If you use it, let me know in the comments below what you think of it. But this isn’t a software review post. 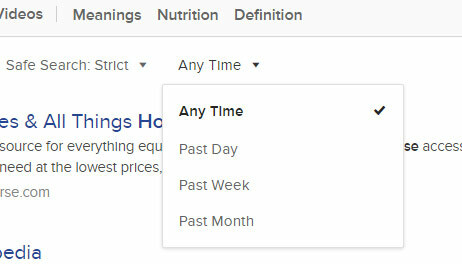 Mike wants to know how to do a search, and limit the search results to a particular period of time. He specifically wants to see only the things that are from within the past 3 years. And he mentioned that the search engines he uses are DuckDuckGo, Bing, Yahoo and Google. Here’s how it works for each one of these. Summary: able to do it. Bing.com is the search engine owned by Microsoft. They do everything they can to promote it and encourage people to use it, but it still only gets used by about 7% of internet searches globally (by comparison, Google gets about 81% of searches). Personally, I don’t like Bing at all. Yahoo.com is one of the oldest search engines. In fact, I remember it being the first one I used when I first got on the internet. But back then it was called a “search directory”. If you use Firefox, the default search engine it uses is Yahoo (I usually change that to Google when I’m setting up a new PC). 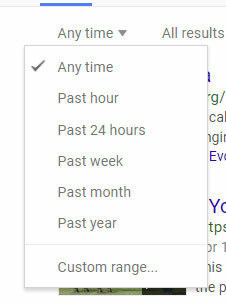 Google.com – you’ve probably heard of it. It’s the 800 pound gorillas in the search engine industry. And why do so many people use it? Not because they force it on people like Bing tries to. It’s because their search results are the most relevant. As you have probably guessed, out of these 4, I prefer Google just because the search results usually give me what I’m looking for. Want to try a comparison for yourself? 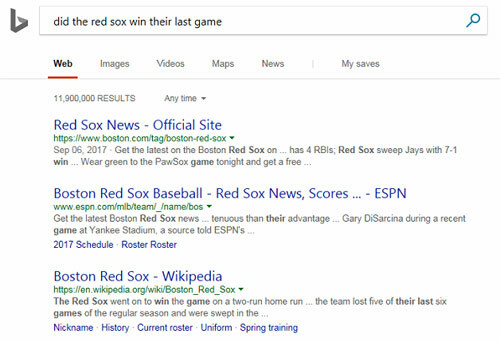 Do a search in Bing, then open a new tab and do the same search in Google. 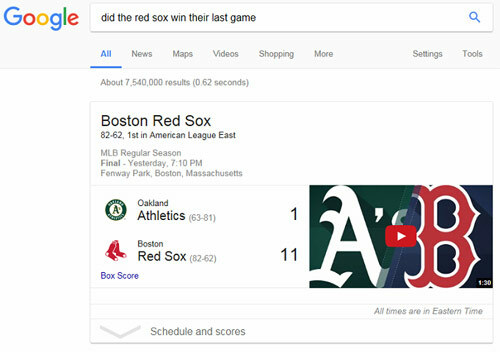 For example – I searched on “did the red sox win their last game?”. I know that’s not a comprehensive evaluation, and in some cases Bing search results might be better. But overall I think Google does a much better job. What do you think? Comment below.